Home » Uncategorized » Shivering Those Timbers! 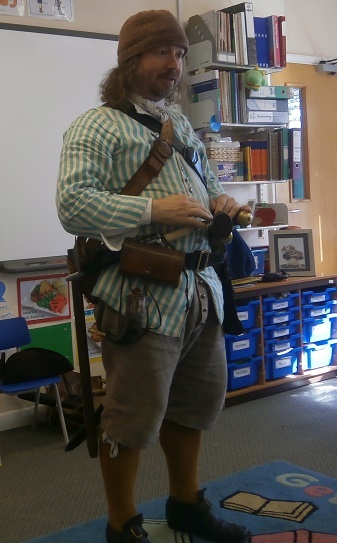 The start of the term has been a busy one for several of my characters: Sir William Petty has been telling the story of the Great Fire to rapt audiences, John ‘Swift Nicks’ Nevison has had to hide himself from the hue and cry in a number of schools already, and Captain Burwash has been preparing for a new cruise. On Thursday the pirate captain managed to find a company of scholarly and artistic children to help his preparations. 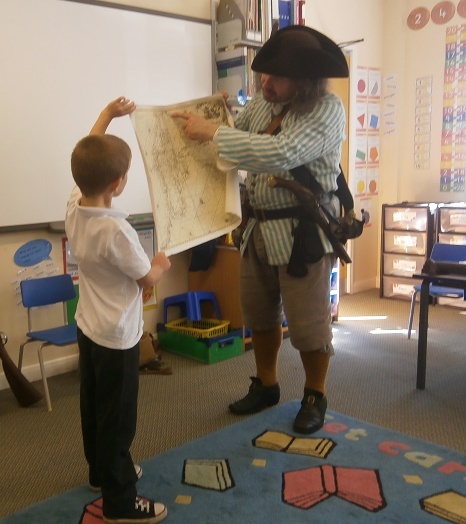 In return for tales of piratical derring do, and a chance to see the captain’s possessions and weapons, such as learning how to load a musket and scrutinizing the numbers, words and pictures on fifty stolen pieces of eight, the children were happy to work for the captain. They designed new jolly rogers, much scarier than the one Burwash’s friend had painted, and they made a great pile of advertisements for a crew, with a big picture of Burwash in the middle. Here you can see Burwash posing for the portrait on the advertisement. He was not sure how to stand but in the end thought that as he was recruiting in Hull he might as well have a tankard in his hand, for he reckoned he often would. The children wanted to know how he planned to find his way around the West Indies and along the Spanish Main, so he showed them one of his maps. It turned out that although the children were dressed as every species of pirate – from buccaneers to privateers, from Sally Rovers to Flibustiers – they only knew four of the thirty two winds on a compass. The captain began to wonder if it was possible that they were really land-lubbers in disguise. 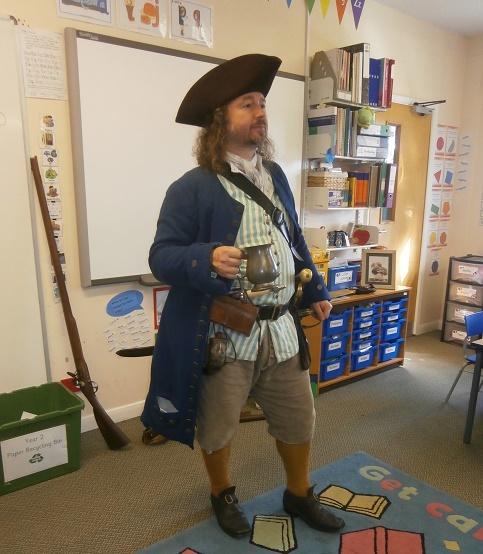 The children had a LOT of questions – so many that the captain decided he could stay a whole week and still not answer them all. They asked about all sorts, even his hat. After telling them all about his very fashionable tricorne, he admitted that very few sailors and pirates wore them at sea, mainly because they were likely to blow away in the wind. Then he showed them the sort of hat much more usually worn by English seafarers. It was not the sort of hat the children expected to see. It seems pictures in books and reality can be quite different. To see which of my other characters you might like to visit your school, have a look at my page of Characters. Or click on the highwayman to find out more about John Nevison, or click on the Great Fire of London to find out more about Sir William Petty.